The weather outside is heating up and it is HOT! How about some really tasty treats to cool you and your kids down?? Yoplait Greek 100 has some fun treat ideas to help change up your everyday yogurt routine and stay cool this summer. The 100-calorie strained Greek yogurt, available in eight delicious flavors, has developed the following lower-calorie treats that will integrate protein-packed Greek yogurt into your summer diet and reward you after a hard day’s work (or at the beach). I am excited to share this great recipe that is only TWO ingredients and is made in minutes!!! 1. Remove cover from yogurt; stir well with spoon. Recover and place in freezer, stirring every 15 minutes until consistency of soft serve ice cream, 30 to 45 minutes. 2. 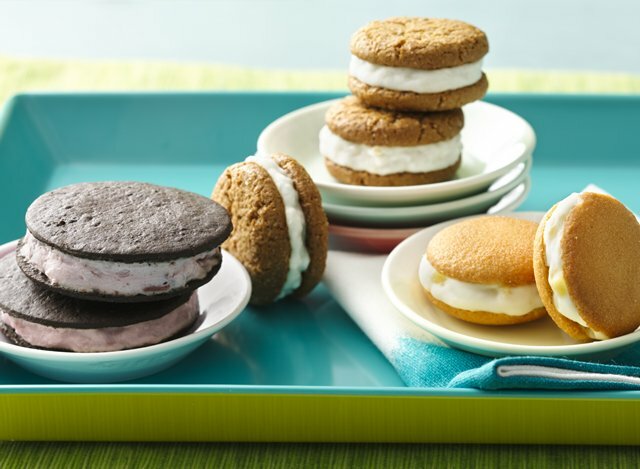 Scoop 1 level tablespoon yogurt on bottom of 1 cookie. Top with second cookie, and squeeze gently. Carefully wrap cookie if desired, and freeze 15 minutes to set. Buy It: You can purchase all Yoplait Greek Yogurt at your local retailer. Win It: Yoplait is generously offering (1) case of Yoplait Greek Yogurt (12 cups) to one lucky winner!